For offices that harmonize body and mind. From Stockholm (Sweden) to Guangzhou -former Canton- (China ) via Birmingham (England), Paris (France) , and in a few weeks Milan (Italy) , the first quarter is always there to instil the rest of the year with ephemeral and sustainable trends that our professional world will experience. With balmier spring weather, comes trade shows time, promoting design and style without borders, for a better health and well-being at work .We are far from sad and strict atmosphere offices. Today we warm up the functional, spin the colours, mix wood, leather and steel to ecological and sustainable materials. Due to the success of office chairs as better back therapy, no more static positions. A seat is now to for move around. Suspensions and horizontal mobility of the seating are adjustable to your liking. Regarding mobile and adjustable worktops, (see our Focus) already adopted since a long time in Northern Europe and the U.S., they are finally gaining ground in Southern Europe. Simply because it is more user friendly, for thinking by yourself but also at two , three or more together. As every medal has its reverse , more “open” offices means more ambient noise and become an unhealthy stress factor. So to minimize small everyday life noises in the office without having them closed, we innovate with phonic privacy screens, sound absorbing walls and furniture. Or by creating quiet zones with elegant high-backed sound proofing seats and with more visual discretion, we design spaces allowing to think, create or trade undisturbed. 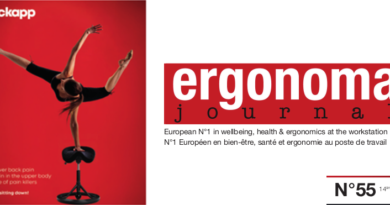 That’s what we saw everywhere and that’s what we shall relate in coming issues of Ergonoma Journal.